The Vega 400G is a next generation ISDN 30 VoIP gateway superseding the old Vega 400 system. The new system is even better value for money than its predecessor and is also easy to provision using Sangoma's online SNAP (Sangoma Network Appliance Provisioning) tool. 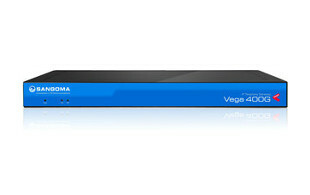 The Vega 400G is available in versions allowing 30, 60, 90 or 120 simultaneous calls. Systems can be upgraded from 30 channels to 60, 90 or 120 channels using licences at a later stage, this makes it an ideal solution for a growing business. In the event of a WAN failure the Local Survivability* feature will let the IP phones behind the gateway call each other, be routed to a back up switch or through the PSTN. The Vega 400G is perfect for redundancy and failover scenarios. * Local Survivability (also known as Enhanced Network Proxy) is a licensed feature. Please contact us for pricing.